It’s sort of weird to see a peripheral-based rhythm game like Taiko no Tatsujin: Drum ‘n’ Fun! being released in 2018, the audience for these types of games far reduced largely thanks to the oversaturation of series like Rock Band and Guitar Hero in years past. It’s even weirder considering this is, in fact, the first Taiko no Tatsujin game ever to reach European shores in the fifteen plus years the series has been around. Have we been missing out on something special all these years? Taiko no Tatsujin: Drum ‘n’ Fun! is your typical rhythm game in that you’re tasked with following on-screen prompts in time with a range of different music tracks. These prompts come in one of two base flavours – a red circle represents a ‘don’ note or a hit of the skin of the drum (left or right side) while a blue circle is for a ‘ka’ note or a tap of the rim of the drum (again left or right side). Larger circles meanwhile require you to hit both the left and right side at the same time while you’ll also come across moments where you’ll need to drumroll for more points. The action you need to perform for each of these depends on your control scheme with four ways to play. Motion controls are easily the worst, the game having a hard time deciphering between the two hit types – ‘don’ notes require a downward motion from the Joy-Con while ‘ka’ need more of a diagonal slice – especially as songs grow in speed and complexity. They’re fine for the lower difficulty songs or for letting kids get involved, but for high-level play, they’re just not accurate enough. Opting for the buttons of a Joy-Con or Pro Controller is as reliable as one might expect – the four face buttons corresponding to the sides and hit type – albeit a little less involved. Playing in handheld opens up the opportunity for using the touch screen, a surprisingly satisfying control scheme but one slightly hurt by the fact you can only use it with both Joy-Con attached (why?). It should come as no surprise but using the Taiko drum set is hands down the best way to experience this game. Thumping away at the drum with sticks in hand feels extremely satisfying and easily the most rewarding when you conquer songs on harder difficulties. 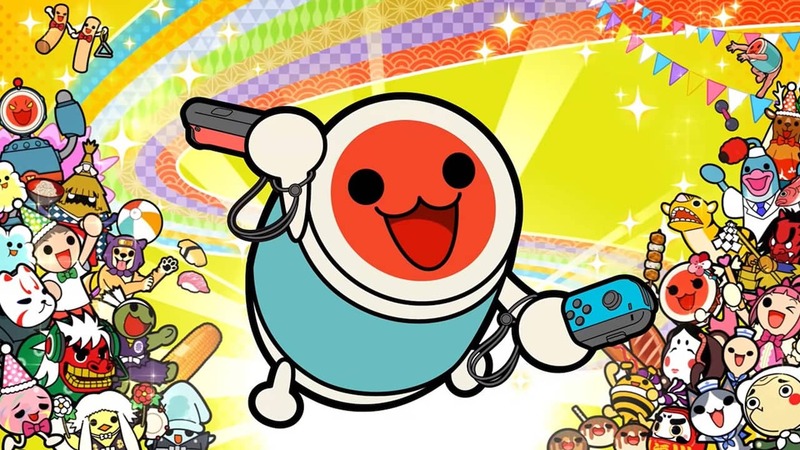 Bouncing between the numerous control types it definitely felt like the drum set offered the truest and most faithful Taiko no Tatsujin experience. The game is essentially split into two modes. Taiko Mode is playable for up to two and essentially acts a score attack mode, the player free to choose any song and difficulty they want. Easy and medium won’t pose much of a threat but do act as nice entry points while hard and expert is where the true challenge begins. Seriously, any concerns hitting a single drum might make the game too easy were thrown right out the window as soon as I tackled my first song on the highest difficulty. It was an unusual shift going from the metal and punk filled soundtrack of Rock Band to Taiko no Tatsujin’s more Japanese focused line-up. The categories include Pop, Anime, Vocaloid, Variety, Classical, Game Music, and Namco Original with the latter three being the only ones I was able to recognise even a small handful of songs. Regardless I had a great time working my way through the game’s 70 plus tracks even just to experience genres of music otherwise unknown to me. Of course, there were some I would avoid after one playthrough (‘Train-Train’ I’m looking your way) but the good certainly outweighs the bad here. Who wouldn’t want a Japanese version of Moana’s ‘How Far I’ll Go’? Nintendo fans will also be pleased to find tracks for Splatoon 2, Super Mario Odyssey and the Kirby series included too. It’s just a shame there aren’t more of them. The game also includes 20 rhythm-based mini games playable for up to four players. A mixture of both competitive and cooperative bouts there’s a real air of Rhythm Heaven here, the situations themselves varied and strange. One game has you timing your beats to set off a firework display while another sees you defending yourselves against a dog throwing sticks and dumbbells. An especially tough one involved us listening to a pattern of beats and then attempt to repeat it back perfectly to order sushi. The mix here is decent and a nice alternative to the standard mode just so long as you have a group to play with. Hours of drumming under my belt I was left with one lingering thought and that’s if the game is worth it without the drum set. I must admit I still had a fun time tapping on the touch pad or bashing buttons against a friend but you can’t argue that some of the magic is lost without a physical drum to whack. To get this full experience though you’re looking at a nearly three-digit price for the full bundle and at a point where we’re seeing great games coming out nearly every week, it’s not easy parting with so much cash just for the one. It’s a tough decision to make especially given how enjoyable Taiko no Tatsujin: Drum ‘n’ Fun! is with the peripheral. Whether you choose just the game or the bundle, the end result is a fun one, just of varying degrees. Taiko no Tatsujin: Drum ‘n’ Fun! is a dizzyingly weird but wonderful rhythm game that’s both easy to pick up but ever so tough to master. Those playing with the drum set will undoubtedly have the best time but even if you opt for its more traditional control scheme there’s still enough fun to be had making your way through the game’s unique song list or facing off against your friends in its party games.